service member | Yes, I Love You Too. They say anyone can take on the challenge and successfully complete it as long as they are willing to work as a team and never give up. It is a test of heart. And with the cadre out there to, uhm, motivate us, I am sure we will be reminded of this often. I look forward to pushing through all of the fun to the end and am glad that my husband and I are taking on this event together! In 35, or maybe 36, days I will be posting an update about surviving this challenge. I’m 5’1″, weigh 123 lbs, and just had a baby 6 months ago. My longest run since her birth has been 2-miles and I haven’t done a ruck in a little over a year. Wish me luck and check back in about 35 days for my post-Go RUCK Challenge story! 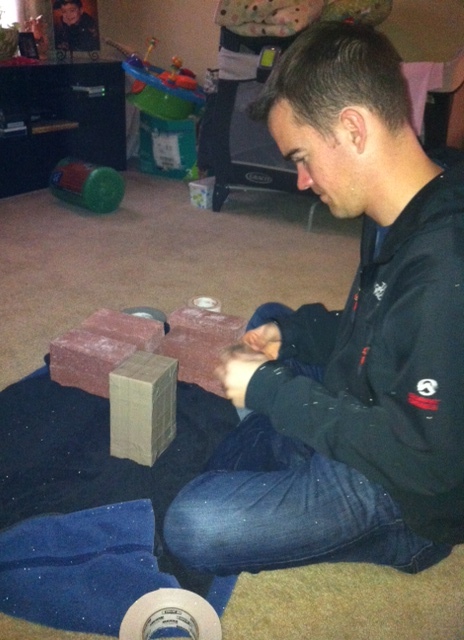 Pictured: My husband wrapping bricks for the challenge. Six for anyone over 150lbs, four for anyone under 150 lbs. Carrying bricks, and water, and snacks, oh my! Are You Going To Miss It? Absolutely. This is it! For the last eight years of my short life I have been a Soldier in the United States Army. I can’t exactly say I have had the most exciting time, but I can say that I am proud of the experience I have had and of the work I have been able to contribute to our ongoing mission in Iraq. But, I hesitate to say this, in just six short months I will no longer be a Non-Commissioned Officer (NCO) in America’s finest ranks. By June of this year I will be just Christina. My mornings will no longer consist of waking early to put on a physical training uniform. I will no longer hustle my kids out to daycare so that I can get to formation by 0620. My days will no longer be made up of ensuring my soldiers are properly trained and have what they need to maintain a good level of morale. I will no longer be a part of the team and family I have grown to love – and hate at times. It is a difficult decision but the time has come for me to move on. I want to focus my attention on the home front, spend more time with my kids while they are little. These years pass so quickly and I do not want to miss a moment if I don’t have to. Am I going to miss it? Absolutely. I love spending the day around soldiers, listening to their war stories as they return from their most recent deployment or hearing their excitement and concerns as they get ready to head out to theater. I will miss hearing “good morning Staff Sergeant” when I drive through the gate onto post, and the silly – sometimes intense – conversations with the people I have come to accept as my brothers and sisters. I will miss the laughter that erupts from listening to one guy tell us about his evenings at home and then hearing another come back with “You clean your guns at night when everyone is sleeping? Dude, that’s called insanity man.” Unless you have been in uniform, there is no way to accurately describe what it is like to have these oddball relationships. Some I see as siblings, others have become my own kids in a way. It is painful knowing that I will not be here to work with these fine people. Sometimes I even think about running over to the retention NCO so that I can hold my right hand up and swear to wear this uniform a little while longer. I feel like there is still a lot to be done, more leadership that I can provide to the young Soldiers being indoctrinated to our team. It is interesting that I have such strong feelings about the Army now. Back when I enlisted, just in 2004, I had a heavy case of cold feet. After graduating high school (I know. Still a baby. ), I spent some time in San Diego, enjoying my freedom. By that time I had already been to the recruiter’s office and was enrolled in the Delayed Entry Program (DEP). At that point, I wasn’t officially in the Army and could still opt out of signing my service contract. The time in California, paired with advice from a very close family friend, had me rethinking what I wanted out of my life. I decided that I was going to run the other way, completely forget about the Army, enjoy some time at college while learning about myself! But, obviously, that isn’t what I ended up choosing. My recruiter ended up talking with me and I decided to take the jump. I was off to basic two months later with my head full of fear and excitement, and my heart full of dedication. I wanted to make a career out of this! In my eight years, and some change, the Army has taken me from Arkansas to Missouri; to Texas, Maryland, Argentina, Iraq, and now Washington. It is where I met my husband, had my children, found a large part of my own personality and character, and where I was able to meet many great friends. The Army is my home away from home, the extended family that makes being far away from immediate family not so bad. This is going to be one of the hardest decisions and transitions of my life. But, it is my time to move on. Am I going to miss it? Absolutely. I have always enjoyed reading but, like every other parent cleaning in pajamas while waiting for the call to jump up and make that next peanut butter and jelly, I have learned that my time is limited. Very limited. Between working full time and coming home to my two kiddos and two pups, I am noticing my reading time has been chucked out the window. Or rather, it has been dumped down the diaper pail. My current challenge: Make it to page 10 of “My Grandfather’s Blessings” by Rachel Naomi Remen, M.D. by the end of the month. You read that right – page 10, end of month. Also notice I said “challenge” and not “goal”. My goal is to complete the book someday. The challenge is actually making it to page 10. Then 20. And so on. Don’t get me wrong, I also love my children and am absolutely enamored with my life. But let’s get real. When we chose to have kids I am pretty sure we all imagined we would be masters of order. Completely in-control baby and toddler whisperers who would sit back for an hour of uninterrupted reading and relaxation time since the kids are on the same nap schedule and they actually nap. At least, that is how it was going to work in my head. The “ha-ha, joke is on you” set in a little later as my beloved book time became filled with important parenthood lessons like how-to-cook-with-one-arm, learn-about-every-super-hero-possibly-known-to-man, and always-have-the-clean-diaper-ready-to-go. What did I do before these kiddos existed? And did I really dedicate that much time to reading? I have no idea. Parenthood seems to have erased all memories of the time before kids for me. I now use that extra space to worry and wonder. Did I pack extra diapers? Where are the snacks? Should we pay the $45 to ship Tunnah-Punnah the teddybear home from the hotel now or pay for therapy later on? And, do we still have books not related to fairy tales or dinosaurs going to school in this house? The answer: YES! And I have rediscovered them. Now, I just need to rediscover what it is like to sit and read more than a few paragraphs at a time. In the little time I have had to flip through and read a few pages of this book, I have gathered the grandfather was a very wise and loving man. I am not asking to replace any of my kid’s time with reading. I realize it is good to have my own time now and then, and when I get it I will fill it with the goodness of books. If you happen to read this book before I do, please feel free to give me a summary. It may be a while before I get to the end. I just want to get to page 10 first. It was taking a while for me to think of what I would title this blog. I have to admit, I am still unsure exactly what I plan to blog about but realized creating the blog in the first place would probably be the hardest part. So, here I sat. Pondering what phrase would be most catchy, creative, and unused. Everything I came up with produced a little red “X” that screamed “everyone else has already thought of that! It’s taken!” Really? How many people could have possibly thought of “Have a Cup of Coffee” for a blog title? Apparently many. Silly me for momentarily forgetting that coffee is probably a large part of almost every American’s morning routine. And that more than one person considered the title would be an inviting one. Yes. Come have a hot cup of coffee while you read my blog. Isn’t this nice? I sat frustrated, contemplating other ways to involve “coffee” in my title. Just as I was preparing to settle on a long, complicated title for this little adventure of mine, my son ran up to the dining table and told me he loves me. It did not register since I was still trying to figure out what catchy word might rhyme with coffee. Toffee. Cough-ee. Maybe a blog about caffeine, sweets, and cold remedies? I must have given a grunt or nod of acknowledgement because he quickly decided I was a lost cause. Just before running off, my sweet guy graciously answered for me. “Oh. You love me too.” I smiled. No matter how caught up I get in the world I know he will always love me and I will always love him. He is the silliest and sweetest little guy I know. I still have much to learn and he is constantly teaching me. Everyone deserves to hear it every day they are alive on this earth. Yes, I love you too. I plan to blog whatever comes to mind, my new discoveries in my every day, and about interests I am certain others will enjoy. There will also be plenty of silliness throughout by my four year-old co-blogger. I am a mom. Every day is an adventure! Comments and suggestions are appreciated!